Avro Ashton – jet history at risk? | Shortfinals - aviation and more! Avro Ashton – jet history at risk? Some things just feel….wrong. It is not until you wander over, and read the small display placard alongside this exhibit that it hits you – and, if you had been with me on this visit to Newark Air Museum, I dare say you would have seen me turn white, as the blood drained from my face. It was rather like seeing a Henry Moore sculpture overgrown by weeds, or a Picasso painting discarded in a ditch. 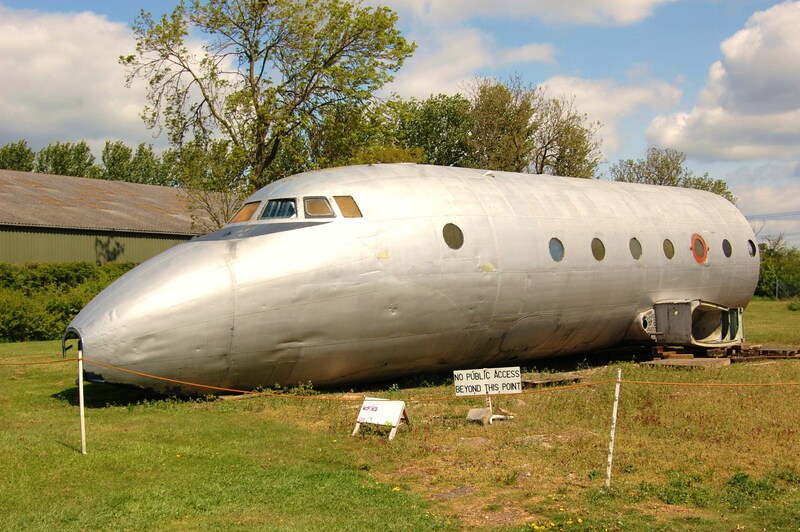 This incomplete, 11 foot diameter fuselage is the ONLY surviving major section of a jet-powered Avro Ashton (and by extension, the piston-engined Avro Tudor airliner from which it was converted). The six Avro Ashtons were all converted from surplus Avro Tudors, an aircraft type which was a major technical and financial embarrassment for Avro. The Tudor, with components taken from the Avro Lincoln bomber, was powered by four 1,770 hp Rolls-Royce Merlin 621 engines and was supposed to become a viable transatlantic airliner – it didn’t, and went on to be a commercial disaster. Even Roy Chadwick, its designer (and the designer of the famous WW2 Lancaster bomber) was killed in the take-off crash of a Tudor 2, in August, 1947. Immediately after the end of the Second World War, civil aviation in the U.K. was in a state of flux. ‘Second-hand’ ex-military types, such as the Douglas Dakota, Avro York and Handley Page Halifax/Halton were used to restart airline routes; even ex-Luftwaffe Junkers Ju52/3m aircraft were commandeered for internal services by British European Airways in 1946! Jet power, both turbojet and turboprop, was the wave of the future, and in the immediate post-War period a series of experimental air transport aircraft and prototypes were the subject of trials programmes. These included the Douglas Dart Dakota (two Rolls-Royce Dart turboprops), the Vickers Nene Viking (two Rolls-Royce Nene turbojets) the Armstrong-Whitworth AW.55 Apollo (four Armstrong-Siddeley Mamba AS.1 turboprops) and the Avro Ashton. The prototype Ashton 1 first flew in public at the 1950 S.B.A.C Farnborough Airshow, and each individual aircraft of the six converted Tudor airframes was slightly different from the others, as they were designed by Harry King of Avro to explore different aspects of jet flight and flown during a five-year long research programme. The normal crew complement was five – pilot, co-pilot, navigator, radio operator and flight engineer, all contained in a pressure cabin which included the flight deck, although extra technicians could be carried; the pressure cabin maintained an apparent altitude of 8,000 feet at a cruising altitude of 40,000 feet. Other sections of the fuselage contained test equipment. The Nene Mk. 6 engines were placed in pairs in two nacelles under the wings, each producing about 5,000 lbs static thrust; this was sufficient to give a maximum speed of 440 mph, and a range of 3,540 miles. Although the Ashton looked, and flew, like a jet airliner it was not intended to enter commercial service. Indeed, passengers would have been very disturbed had they noticed the 24″ diameter escape tunnel in the belly of the aircraft, to enable the crew to bail-out in an emergency! The Ashton shown here was built as a Tudor Mk. 8, and converted to an Ashton 2, WB491 (G-AJJW); for part of the time it flew missions manned by RAF personnel, and at other times for the Ministry of Supply. In August 1960, WB941 could be seen hangared at the Rolls-Royce test airfield at Hucknall, Nottinghamshire. It had taken part in extensive trials of the R-R Avon and Conway engines, which were fitted in custom-made ‘pods’ underneath the fuselage. The Conway trials were undertaken, in part, by Squadron Leader Alexander J. Heyworth, RAF, DFC and Bar, Mentioned in Dispatches, FRAeS, who eventually became Chief Test Pilot for Rolls-Royce Ltd.. Even though it did not have a large production run, and was not intended for airline service, the Ashton’s significance to both the development of jet transport and aviation as we know it today cannot be over-emphasised. Examples of ‘first generation jetliner’ technology are astonishingly rare. The prototype Rolls-Royce Nene-powered Vickers Viking, G-AJPH, for example, was converted back to piston engines and eventually scrapped. Ideally, this rare artifact should be under cover, restored, and the centrepiece of a display showing the rise of civil jet flight, a technological advance which has changed the world. Thanks for this, I had not known of this aircraft. Your are right and hopefully it will be better placed as well as restored. I agree, Joe. When I saw it I felt quite sad. You could make a great display about the rise of the early jet airliner, using the Ashton as a centrepiece. Or even a spectacular display on the life and work of the magnificent Roy Chadwick (Lancaster, Lincoln, Shackleton, Vulcan, etc), particularly since the museum already has on display an original section of Lancaster fuselage (with WW2 markings), two Lancaster gun turrets and a ‘Bouncing Bomb’ as delivered by the Lancaster, AND has a Shackleton parked about 400 yards away from the Ashton! Really sad. I don’t know how some bits of history are deemed more worthy of preservation or display than others, but the fact remains that chunks of our past disappear out of sheer indifference. And once they’re gone, there’s no bringing them back. I have no idea when this unique piece of history will be ‘taken in hand’….but I hope that work begins soon! Fascinating! Thank you for sharing this. I stunbled upon your site by researching the Avro Jetliner. Have you considered contacting the aviation museum in Hamilton? or if there is still one in Downsview toronto. Perhaps they may have the resources to rebuild this fuselage into a museum piece. I am uncertain what the future holds for this very important piece of aviation history. All I can do is keep flagging up similar cases. I am glad that you are looking into the Jetliner….another very important milestone!